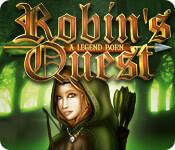 Robin's Quest: A Legend Born is rated 4.6 out of 5 by 64. Rated 5 out of 5 by smilingsun72 from A parent's path lay way for a legend to be born! Completed: This was in my "games you'll love/like" and it was a sale day so I decided to buy it after reading the reviews first. I can say I enjoyed this very much. For the price I got a lot of extra goodies you'd get in a CE. The story was very well done. The voice acting was good. The music score perfect for the games theme. The graphics were beautiful. The games were a variety and not that hard to do. And I loved that it let me know when I completed that scene. (So make sure to look for all the wanted posters of Robin and hidden stashes of loot.) Also, the shooting games for archery was a nice touch. You play as Robin Hood. You help the villagers and rid the land of the bad guys as you gain your Merry Band along the way to thwarting Prince John and rescuing your husband. (The secret's out! Robin's a woman in this game!) I recommend this game for it's family and good ole ye fun! Rated 5 out of 5 by dladymuse from Delightful! Loved this game. Music is enchanting and the story was good. Mini games were pretty tough in some places I had to use the skip button a little too often. Aside from that it was a nice relaxing break from the usual, darker HOGs. Rated 5 out of 5 by tazz29 from still play this game three years later! 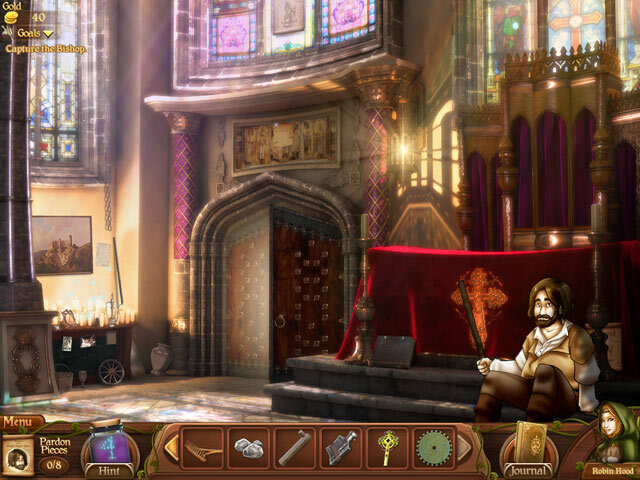 Awesome game, great soundtrack, addictive. Rated 5 out of 5 by rosekaufmann from NOT WHAT WAS INITIALLY EXPECTED A new twist on an old tale: Robin is a woman and not only has to fight to right the oppression of the Brits but help her husband escape from prison. Very well done - it is as believable as the original tale. While on her quest, various villagers will ask her help in getting their money back. Your hints are in the form of fireflies and you can capture additional ones to replenish them when they dwindle. As with the tale, Robin forms a band of Merry Men, each with their own skill. Robin also has to rip down her wanted posters (62) and help her Merry Men find the pieces of their Pardons from the king. You’ll also have to search for hidden gold caches. You may need to return to an area, but once it is completed, you get an “Area Complete” notation so that you don’t waste time unnecessarily exploring unfruitful locations. 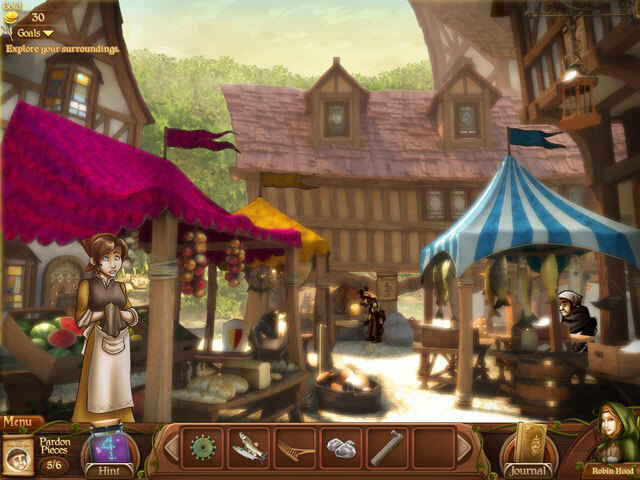 Most of the puzzles have a purpose, such as helping to build a wall or baking a pie to distract the guards (you just happened to overhear them talking about how they snitched pies from the baker while you are in his shop). SUMMARY: An average length game with 16 chapters of an old tale. 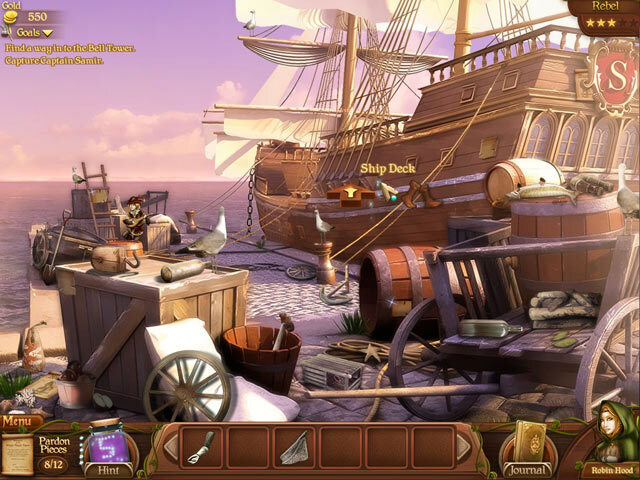 Various inspired quests and puzzles which are integral to the game of helping your fellow Brits and your husband. Done with a good sense of humor and attention to detail. Good production values. Rated 5 out of 5 by LEIZAP from Fun & Easy Little Game This game was quite easy (which is normally a turn off), but had so many exceptional points. Great storyline, fitting music, good puzzles, quaint characters... just a fun diversion from all the scary demonic stuff we usually see! Please more like this!! Rated 5 out of 5 by nospaceleft from Quite enjoyable! The storyline is a nice little twist on Robin Hood. Although the gameplay is pretty straight forward, it was never boring or tedious. There was just enough thinking required to keep it interesting and none of the puzzles were too hard. It was also nice to have well-lit scenes!! I like the "finished" notice on each area...didn't need a map or directions. However, this is not a game for those who want a challenge, but if you'd like to spend a few hours with a relaxing, interesting game....this is the one. Personally, I don't play for scores or achievements but for relaxing and still using my mind (instead of TV zombie...lol) I wouldn't mind 12 other games just like this! Rated 5 out of 5 by BirdLover89 from Cute This was a really cute, enjoyable game, and not dark and gory like so many of the games. This was so much fun to play. I liked the little puzzles, and I liked that it showed when an area was cleared. I had a little difficulty figuring out which power to use at times, but that part added a lot of fun. I highly recommend this game, especially nice for children. Rated 5 out of 5 by Playagrl from Great "Quest" Loved this HOG, it's really entertaining. As most HOGs I play...that's worth the time. Rated 5 out of 5 by milwaukeebry from So much fun! I have played a ton of HOG's. This was a fun change-up from the normal HOG's. I recommend it for a change. It's not dark and you earn skills. Fun! !